Viesa Holiday III is an Italian-made cooler that uses water evaporation to create a natural and immediate feeling of comfort and wellbeing. Essentially, it favours the evaporation of skin moisture to remove excess body heat. This approach differs from that of conventional coolers, which cool the surrounding air and reduce the temperature in the entire ambient space. Holiday III provides natural wellbeing at a contained weight and size, and low power consumption. Aerodynamic, silent, operating at 12 volts with no gas or chemical additives. 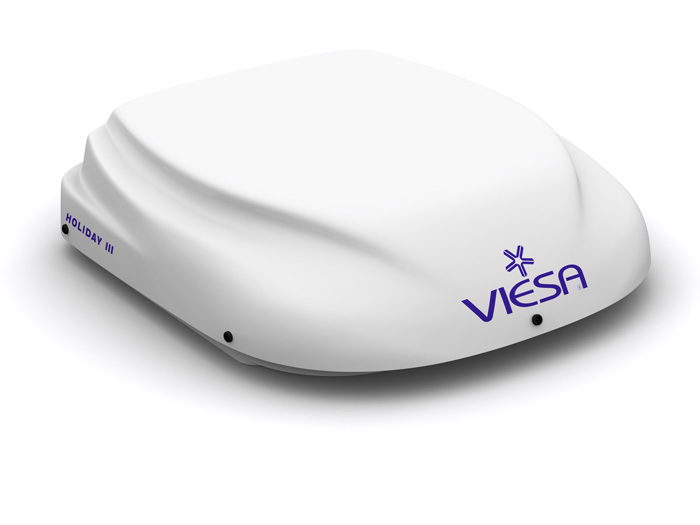 The Viesa brand is owned by Colven, a global leader in the development of innovative state-of-the-art technologies that guarantees quality, reliability and service. The Holiday III is manufactured entirely using “Made in Italy” components (except for the special Colven patented filter, made of a weave of strands of three different types of wood), and assembled at the Montemurlo production site of Ital Colven, a subsidiary of the Colven group from Argentine. The electronic control unit has an LCD display that allows to set all the conditioner’s functions and can be remotely controlled using the provided unit. The system can monitor the battery charge and shuts itself off automatically in the event of low voltage (10.5V), in order to prevent possible damage to the accumulators. Multiple safety protection systems are designed to intervene in the event of a water failure (buzzer signal and pump auto-shutoff), reverse polarity, or operating malfunctions of some components. Twentyfive fan speeds available, with a start/stop programming control timer and a “fan only” function (with the pump disabled). Designed to refresh an environment of no more than 8 linear meters, and with a maximum of 4 people on board, the Holiday III operates at 12 Volt and is installed at the center of the passenger cabin where usually a standard (40 x 40 cm) or midi (50 x 70 cm) porthole is located. It is directly connected to the vehicle’s water system. Filtered, refreshed air is blow through 4 adjustable and independent diffusers that are integrated into the ABS cover fitted onto to the porthole. The cover also features an elegant external frame that can accommodate four integrated spotlights (optional). Evaporative air coolers work by lowering the perceived temperature, i.e. the heat our body feels. This value is influenced by four different factors: the ambient temperature, relative humidity (i.e. the ratio between the quantity of water vapour contained in a given mass of air, and the maximum quantity of water vapour the mass of air can contain under the same temperature and pressure conditions, measured as a percentage), ventilation, and humidity density. The Viesa evaporative conditioner controls all four of these factors to create a feeling of personal wellbeing, rather than on the surrounding environment. This provides a proper evaporation of humidity on the skin, a phenomenon whose effect is to remove heat. The cooling process starts with the evaporation of water from the filter surfaces, thus lowering the temperature. Cooled air then enters the cabin at an optimal relative humidity of 40–60%, and at a very low density. Stabilizing the internal relative humidity is essential, since if the air is too damp it is harder – or even impossible – to allow perspiration to evaporate. Similarly, humid air introduced at a low density (i.e. with tiny nebulized droplets measuring 0.002 microns) enables moisture to be distributed over a larger surface, facilitating faster evaporation. Evaporation is further promoted by forced ventilation from the cooler. Filter evaporator composed of three natural fibres. Our technical staff is at your disposal to provide any information; write us and we will reply promptly. Cap. Soc. Euro 100.000.00 i.v.